West Virginia University and the North American Nanohertz Observatory for Gravitational Waves (NANOGrav) are long-time partners with the Arecibo Observatory, which is located in Puerto Rico and is home to the second largest telescope in the world. NANOGrav is the largest single user of the telescope and has worked closely with the scientific staff for many years. Many WVU and NANOGrav scientists have lived or worked in Arecibo and continue to visit the observatory. Through the close collaborations that WVU and NANOGrav have with the observatory and its surrounding community, we are acutely aware of the devastation which has resulted from Hurricane Maria. The territory of Arecibo has been ravaged and residents are desperate for the basics like food, water, diesel fuel for generators, and medical supplies. The storm has delivered a devastating blow to the entire island, and people are in urgent need of assistance. Many of the 100 empolyees at Arecibo have lost their homes and are sheltering at the observatory. The facility's generators are in good condition relative to the surrounding area, and the observatory is serving as a FEMA emergency center. However, the situation in Puerto Rico is critical. Power and utilities are not expected to be available for months and the observatory's supplies are limited. Working with our colleagues at the Green Bank Observatory in West Virginia and NANOGrav, we are seeking the help of WVU, administration, faculty, staff, students, alumni and friends alongside the NANOGrav community to reach out and help the observatory staff and the surrounding community. Please consider making a gift today for the critical support that is desperately needed. With your help we can provide basic resources like food, water, diesel fuel, medical supplies and housing. 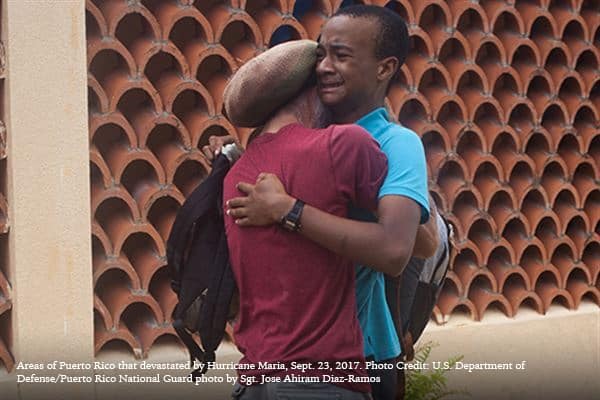 Let's come together as ONE WVU and ONE NANOGrav to contribute funds to our friends in Puerto Rico. 100% of your donation will go to SRI international, which is an independent, nonprofit R&D center and the governing agency for Arecibo Observatory. All international gifts will need to be processed at the following number 877-791-4344, please reference "aid to Arecibo Observatory, Puerto Rico"
A simple 10 dollar donation can provide blankets for individuals in need. $30 can provide 10 cases of drinking water for hurricane victims. $40 can provide much needed meals for a family of four for one day. $100 can provide much needed diesel fuel for generators. Can provide food, water, and clothing to a family that is sheltered at the Observatory. $300 can provide much needed medical supplies to the Arecibo community.